The Federal Government demonstrated its harsh attitude towards job seekers with the announcement on Monday of a new regime that will see unemployed people forced to look for 40 jobs a month and to take part in work for the dole or training for up to 25 hours a week. 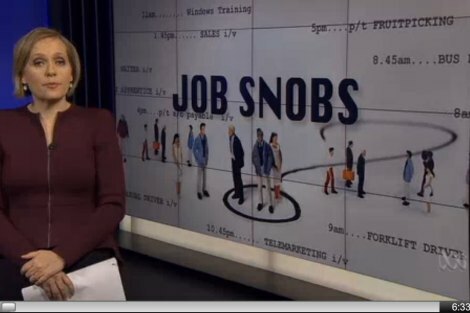 The Coalition's rhetoric around the issue amounted to victim-blaming, with assurances that the new rules would 'improve the prospects of job seekers' and Employment Minister Eric Abetz reviving the term 'job snobs'. Yet evidence shows that work for the dole doesn't get unemployed people into jobs, while voters have expressed concern that the Government's budget measures will create a more unequal society. This latest crackdown on unemployed people reveals disdain for the findings of poverty and unemployment research — an attitude that the Treasurer, Joe Hockey, displayed many times while selling the Federal Budget. Hockey and his colleagues are far from alone in implying that unemployed people are work-shy dissolutes who require hard-nosed moral reform. What's astounding is that their role as public figures doesn't stop them getting away with the kinds of views that produced the horrors of the workhouse. Imagine how the quality of the debate would improve if those who blamed the victims of poverty and illness for their plight were publicly labelled welfare sceptics or denialists, and forced to back up their claims. Social research academics would be thrust into the spotlight, arguments would fly furiously back and forth at dinner parties, frontbenchers who vilified the unemployed would be ridiculed, and Facebook pages would spring up to shame welfare sceptics. Most importantly, poor people in this rich country might be allowed to live with some measure of dignity and security. The media is continually criticised for the way it reports on the science of climate change. Yet even when it pits a climate denialist like Andrew Bolt against a CSIRO researcher like Dr Steve Rintoul, the discussion encompasses the quality of the science. While the big polluters flood the public sphere with misinformation, respected news sources such as Fairfax accept that climate scientists are the authorities in this area. The ABC has a policy of following 'the weight of evidence' on the issue, and says it has 'well and truly moved on from the debate as to whether or not AGW is real'. Yet public figures get plenty of leeway when it comes to ignorance about welfare issues — even when that ignorance impacts on hundreds of thousands of people. You'd never guess from the Coalition's pronouncements that a solid body of poverty research, developed over decades at postgraduate university level and in the research units of welfare groups, is at odds with their views. Sure, callous statements attract controversy, but the arguments against them are often emotive rather than evidence based. Labor is not much better than the Coalition. With hardly a whisper from the media, Julia Gillard announced as ALP policy during the 2010 election campaign that unemployed people who did not attend their Centrelink appointments would be stripped of their benefits. Few challenged the implication that this group were lazy and unmotivated rather than battling problems like homelessness, illiteracy and mental illness. You wouldn't know, from the major parties or most of the media, that welfare advocates and researchers don't claim that payments alone are enough to fix poverty and unemployment. They've been saying for decades that prevention is better than cure, and creating programs that have had astounding success in keeping at-risk families together and giving long-term unemployed people the resources to find and keep real jobs. Yet income support remains an important basic right, and needs to be increased as a matter of urgency — do we really want a return to the horrors of Victorian England, where death from starvation was not uncommon? Rarely do we hear in the broadcast media from academics in this field. This means the general public remain ignorant of the basic concepts around poverty, welfare, and disability. Worse, it is socially acceptable to make sweeping remarks about poor and unemployed people in a way you wouldn't dream of doing for any other group (we have laws against racism and sexism, but none against classism). Welfare saves lives. The idea that it is toxic is itself toxic. It's time for the media to avail itself of the expert evidence about the causes of poverty and unemployment and how to solve them, and to dispute wild generalisations about users of the social welfare system. They should also report on how each party's actions in this area stack up against poverty research. The Greens, for example, have renewed their demand that the dole needs to increase by $50 a week — an increase in line with what the Australian Council of Social Service recommends. If this issue received the scrutiny it deserves in the media there would be a sea change in attitudes to poverty, unemployment and income support over time. Perhaps eventually we'd even become the fair society we like to imagine ourselves to be, and the public money we already spend on social research would bear fruit in a healthy, confident generation of young Australians of all classes and backgrounds who would be eager and ready to take on the world. Recent articles by Catherine Magree. I'm with you Catherine. Perhaps we could also celebrate with an 'Unemployed Pride' parade resplendent with a vibrant cross-section of the employment-deficient community. An opinion piece by Dr Victoria Sheen from Monash University published on the ABC's Drum web page neatly underscores the government's cruelty in requiring the unemployed to seek up to 40 jobs a month: "The overall unemployment rate is now 6 per cent, and 13.5 per cent for 15-24 year olds. In May there were 146,000 job vacancies with 720,000 people unemployed. Another 920,000 were underemployed and wanting more hours of work. Underemployment is a very important labour market indicator as, under the terms of internationally agreed labour statistics collection, an individual is counted as employed if working one hour a week for pay or profit. Altogether, these figures mean 1.64 million people who have no work or not enough work are potentially competing for available job vacancies." Her figures, taken from the Australian Bureau of Statistics, show 1.64 million unemployed competing for 146,000 jobs. This government is driven by nothing more than blind ideology. Thank you, Catherine. This has been so needed to be said ... shouted from the rooftops, in fact! Classism is one of the hidden (or not so hidden) 'isms' that has dominated Australian thinking, consciously or unconsciously, since the beginning of this nation ... no doubt imported from the 'mother country' along with those poor unfortunates who were exiled for stealing a loaf of bread to prevent starvation of themselves and their families. Perhaps we will see history repeating itself ... but where will we find a country willing to act as jailers for us? England could prove ignorance perhaps of the true roots of poverty. What is our excuse? Sad to see what Jesuit educated Catholic leaders like Tony Abbott and Joe Hockey have become.They forgotten about God and who put them there. There is truth in Fr Ted Kennedy saying the Australian Catholic school system has for decades been producing its full share of racists that fully blends in statistically with the rest of society. As for the unemployed, there are so many that I have met on volunteer duty, qualified teachers and architects but of Indian descent, living in commission housing due to being scapegoated to the point of not finding work and coming up against the white mateship system -the white person is right even when wrong.They feel duped by deceitful systems.Whites don't experience this treatment.There are 2 laws in Australia, one for white and one for blacks.So where do Australian citizens that are educated Indians end up, there capabilities are happily taken by whites as there credit with Indians systematically forced in becoming economic refugees. Thus promoting the system of white prestige and white self belief. Where is the help?Why is Catholic Church not making a statement about these deceitful systems so immigrating, dark skinned innocent families can make informed decisions about coming to Australia? Thank you very much, Catherine, for what you have written. I am sick and tired of people on welfare being put down. Poverty is real and there are simply not enough meaningful, properly-paid jobs for all Australians. This is the issue that has to be addressed. What you write about welfare was extremely encouraging: "Welfare saves lives. The idea that it is toxic is itself toxic. It's time for the media to avail itself of the expert evidence about the causes of poverty and unemployment and how to solve them, and to dispute wild generalisations about users of the social welfare system." 'Welfare' implies much more than being given money for food and clothing. It implies also human happiness, self respect, a sense of being worthwhile and of value to others and society.The great error and sadness is that we as a society concern ourselves in the main with the economic implications of welfare and ignore the other human dimensions which are far more uplifting for the individual. Some years ago for my sins I chaired a committee commissioned with the task of examining domestic violence in modern society. Amongst a number of enlightening submissions, that from the Commissioner of Aboriginal Affairs provided evidence that in the five Aboriginal communities where work for the dole was implemented in the pilot studies of the late 1990s, domestic violence was virtually eliminated along with drunkenness. The children were regularly fed and attended school. The work done involved community service such as cleaning up the town, repairing damaged buildings and so on - all under tradesmen supervision. Accompanying this was a remarkable improvement in community wellbeing ('welfare'). The Commissioner stated that the communities welcomed the scheme and had benefited greatly. The participants apparently saw themselves as genuinely employed which indeed they were. Maybe we should revisit this experience in society generally and remove welfare planning from the domain of the socially unskilled accountants and economists! Clearly, when there are no jobs available in the commercial sector, work for the dole must provide community activity as described above as a requirement for being paid The benefits might well be very rewarding as happened in the pilot Aboriginal communities. There are many options for employment that should be explored. No one can deny that there is a quantifiable number of homeless, people disabled mentally & physically, and single parents with children who will suffer if made subject to the Fed Govt’s measures. The media and that includes you Catherine Magree use these people as the platform to take the government to task without any further comment. They fail to point out that these people fall under the care usually as I understand it, of Centrelink which is understaffed and then by some with varied understanding and people skills, poor training and underfunding. It is this bureaucratic group which needs intensive training. Those apart there is a much larger unemployed populace which for one reason or another draw benefit when some greater effort may reasonably be expected of them to seek employment. They are the government’s real target and not to point this out is a grave error on the part of the media leading to undeserved fear by those first mentioned above. There are so many groups who have something essential to contribute to a truthful picture of what's really going on. The problem seems to lie in linking the research of academics, the observation of the grassroots workers and the experience of those 'on welfare'. Too few resources of time and energy to do this well, perhaps - but if only we could get it together, what a powerful and truthful story we could tell. By the way, I appreciate John Frawley's post - there's something very important there about the dignity and effectiveness of working together on common projects. Not all workers for the dole can experience this. Back in the 60's when I worked for the CES (C'wealth Employment Service, we would regularly go out ourselves to employers seeking jobs that we could offer our 'clients'. It was a good partnership - we expected those on the dole to be looking for work but we also were proactive on their behalf. The privatised CES is no more and with it the compassion of many who worked there. In my younger days, I have been out of work and I hated going on the dole. There is dignity and self esteem in work and I have taken some horrible jobs rather than be unemployed. The argument is not simple: I do believe that too many people are unnecessarily on welfare but it becomes a habit and many need a little (or a lot) help from someone who will walk along with them, show them the way and build self esteem and independence. 40 contacts a month is unrealistic. Eave the stoutest ego would struggle after a dozen knock-backs. The Australian job market has changed in the last few years. I was unemployed for two and a half years and it is very demoralising. I was desperate to get out of the Centrelink system and even tried to clean houses to be told that you need a qualification to to do that. I am very lucky because I am now employed in a job that I love. However, there are two important points that need to be made here. 1) There are some people who unfortunately do rort the system and changes do need to be made to address that. I believe training and on-the-job work should be introduced for long term unemployed. This can boost self-esteem and promote the learning of new skills. 2) Listing 40 jobs a week is an invitation for recipients to lie and/or create fictitious job opportunities in a tough market. Politicians need to spend a couple of months receiving only government benefits and they should be subjected to the same bureaucracy they create and perpetuate. Very difficult finding work despite having obtained a second forklift licence and Warehouse Certificate 3. Good experience but age - 60 seems to be major problem . Keep fit cycling and playing veterans hockey. For many years I worked gathering information for surveys. There was nothing more depressing than door knocking in a large high-rise where in apartment after apartment there was an unemployed person sitting in isolation watching "Days of Our Lives". Much healthier to go out and work for the dole rather than feel useless. I also worked with older unemployed people in an Op Shop. They had the maturity to know that being out among people, doing something useful for the dole was keeping up their self esteem and preventing depression. What an elucidating, inspiring & educative article on the misrepresentation & lack of evidence based information on income support & our Welfare System. Babanced & touching! Thank you I too am concerned at the treatment given to the poor and the defenceless we need facts, stats & evidence, speculation & callous statements are used by media to sell newspapers! There is structural adjustment in the labour market - mining employment levels are normalising and other industries like automotive are shrinking in the face of a no-subsidy model. Vacancy levels are down. The current ideology is not supported by the statistics - there is insignificant entrenched, wilful unemployment, yet the government has constructed a policy for an issue that doesn't exist, so it can beat its chest to the far right and the shock jocks. Well, I guess when you are bereft of constructive ideas, kicking the crap out of the unemployed seems like a fair thing. According to the linked "Crikey" piece, Andrew Bolt believes humans are responsible for "a bit" of global warming. Yet he earns the derogatory label "denialist" here. Interesting. The Doran/Zimmerman paper ("Examining the Scientific Consensus on Climate Change", 2008) famously established a 97% man-made global warming "consensus" on the basis of affirmative answers to two questions: 1. "Has the earth warmed since 1800?" 2. Is human activity a significant factor in that warming? (paraphrased). Bolt answers yes to 1. and - depending on how the ambiguous "significant" is interpreted (detectable? ), he could easily answer yes to 2. So if Andrew Bolt is a "denialist", perhaps much if not all of the 97% scientific consensus is "denialist", too ...? How ecumenical! Thanks for clearing that up. "Do we really want a return to the horrors of Victorian England, where death from starvation was not uncommon?" Why single out Victorian England ... one of the first places and eras in history where the prospect of death by starvation hitherto faced by the vast bulk of mankind began to recede, thanks to the advances provided by the market economy? Consider that the linked source is an article in the London "Times" of 1850 concerning the death of one man by starvation. So, one man dying of starvation in 1850 was national news in Victorian England! That actually reflects favourably on the situation, for anyone having even a passing acquaintance with economic history. Thanks, Catherine, but nothing in the Bolt link ( a valuable list of his positions- ta) refutes my argument that if he is to be termed a "denialist", then on the same grounds (admitting global warming since 1800, admitting some of it is human caused) so might be some or all of the Zimmerman 97%, since affirmative answers to the two Zimmerman forensic questions can be easily interpreted as compatible with AB's position, even in the linked Bolt piece. And on death by starvation in Victorian England: To say "death from starvation was not uncommon" in Victorian England raises the question: compared to what? Compared to modern developed Western economies, yes, it was much more common, and nothing we in more advanced capitalist economies (standing on the shoulders, as it were, of Victorian-era capitalist enterprise) would like to return to. But compared with previous centuries and contemporary pre-industrial societies, Victorian England stands up very well. So to single out Victorian England as somehow notoriously horrific for its starvation rates when it was among a few societies in the world that was leading the way in lifting its masses out of poverty, starvation and child labour is highly misleading - even, dare I say it, denialist. Even Marxist historians like the late E.P. Thompson acknowledged the real and significant material improvement of the poor in 19th century England. What about the 38 year old male unemployed since leaving school with learning difficulties and poor motor skills. He has spent his life applying for jobs and satisfying the requirements of Newstart. Could one of the pollies give him a job as an office assistant. He would certainly appreciate it. I see your problem Ms Magree. You think you can change the mind of conservatives with those fact thingys. Didn't you know, they have their own, not quite so connected to the real world, 'facts', that they depend upon? Rates of HIV infection are rising, while stigma is in decline. Some believe the only way to contain the virus is to maintain the stigma against those living with it. But the majority view is that those suffering should be empowered. If the law and the media support them, there is hope that the community will move rationally towards an end to the crisis.